I cannot believe we are half way through the year! I am beyond excited for the second half 2015. The first half was extremely memorable and I have a feeling that the second half will be just as impressionable. The first half of 2015 included a Seattle and New York trip, Palm Springs, Pismo Beach, my first Ragnar Relay, 2 half marathons, moving out, moving in, a new cycle job and a new certification. I have a feeling the second half of the year will be even more focused on travel with all of the trips planned from August on. With the second half of the year beginning, here are some of my goals for the start of July and some through the balance of the year. 1) Increase my daily water intake – Oh how I struggle daily with this one. Some days I can do 20 cups no problem, other days I go to bed realizing the only water I consumed was that in my watermelon! When I keep my 32 oz water bottle handy, it’s easier to drink 2-3 bottles a day. However, when I forget the bottle, I forget to drink water. 2) Start a triathlon plan / increase swimming – As I mentioned a few weeks, I got the bike and started swimming while taking a break from running. My cycling is the best it has ever been. My swim, not so much. The upside is that with the millions of things I am doing to fix my back, I think getting back together with running is on the horizon. 3) Take more fitness classes – Basically just read this post because I need to stop thinking about it and just start doing it! 4) Plan our Miami trip – My birthday is in August, the husband’s is in September. For my birthday we are going to Portland, for his we are going to Miami. I have booked the flight and hotels but that is it in regards to planning. Since we are two months away, I would like to start planning some things to do in September, particularly getting to the Everglades. 5) Research for Thailand and Greece – We have booked our Thailand trip for November and we know we will be going to Greece in February. And that is the extent of planning. Side note: I am starting to sense a trend that being “an adult” is pretty much a fun sucker and prevents me from doing what I want. Anyways, that’s another topic for another day but I need to at least start thinking about the trips and planning what is needed for us to travel to both countries. 6) Read more – To be less vague, I am aiming to read 6 books for the rest of the year or one a month. I love to read but life just gets in the way sometimes. I need to be better about taking time to do things that I love… that starts with reading (yep I am a book nerd). These are just a few goals I would like to focus on this month with some extending past this month into the balance of the year. Being a Type A personality, I love writing my goals down to refer back to as much as possible throughout the month. Here’s to another wonderful month! 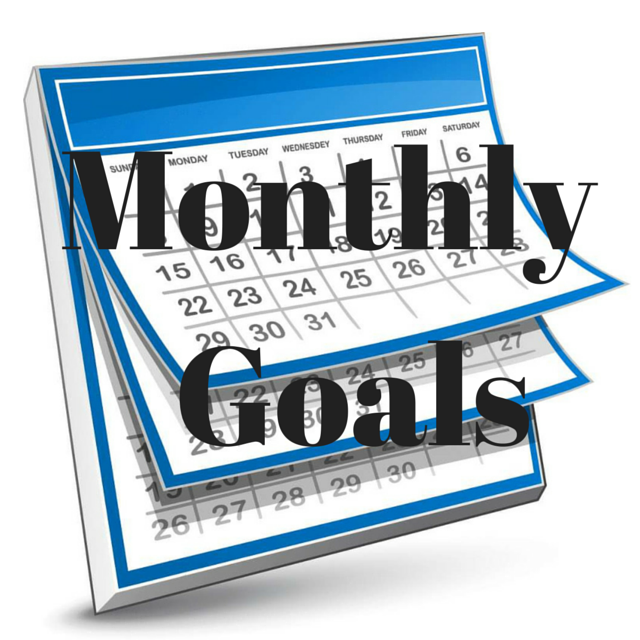 Tell me: Do you write down your monthly goals? If so, what is one of your goals for July?